For those of you who have been reading my blog for a long time already know that I love Purex laundry detergent. Not only does Purex get your clothes clean, but it costs much less than the other leading brands. And I've given away a few bottles and packs of Purex in the past and I have another giveaway for you today now that a new product has hit the shelves, Purex plus Oxi. 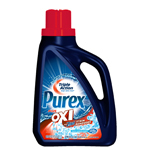 I have to say that this is by far my favorite Purex product. It's the most powerful Purex detergent available and with three kids under the age of 5, I need a powerful detergent! Well what I really need is a maid, chef, personal trainer, and nanny, but a powerful laundry detergent is a great laundry helper. Purex with Oxi has three stain fighting enzymes to work on over 101 different stains. My son is possibly one of the messiest eaters and his shirt with chocolate and strawberry yogurt smeared into it came clean without any pretreating. I'm terrible at pretreating my clothes, I forget about it in the rush that is bath time. In addition to my contest, you can win with Purex as well. With three stain-fighting enzymes, Purex plus Oxi is the most powerful Purex detergent. Purex wants to give 1 lucky winner $1,000! There will also be 250 2nd place winners that will each win $25! All you have to do is click on the link below to enter to win. Now who wants to win a bottle of Purex plus Oxi to try it out for yourself? Enter on the Rafflecopter form. Mommy (that's me!) does the laundry. I don't think my husband even knows how to use the washing machine. My daughter (age 3) is the only one around here who tries to help me with the laundry. Me, me, and ME! Sometimes I feel like doing laundry could be a full time job! I suppose I don't mind washing the laundry, it is the putting away that I HATE! That could be why, I have last week's laundry still sitting in the basket waiting to be put away! Everyone does the laundry here! I do most and my husband does some. I do the laundry for me and my husband does it for him! !